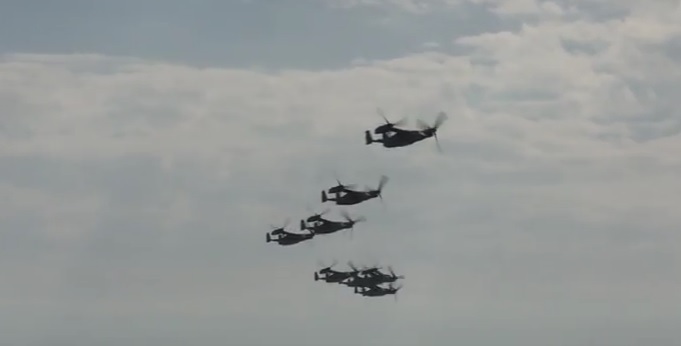 Taken on Feb. 3, 2017, the impressive video in this post features four CV-22s from the 20th Special Operations Squadron (SOS) at Cannon Air Force Base (AFB) and 6 from the 8th SOS at Hurlburt Field flying in formation over Hurlburt Field, FL. Noteworthy this training mission was the first time in U.S. Air Force (USAF) history that 10, CV-22s flew in formation simultaneously. The CV-22 is the Special Operation Forces (SOF) variant of the U.S. Marine Corps (USMC) MV-22 Osprey. The CV-22 Osprey is a tilt-rotor aircraft that combines the vertical takeoff, hover and vertical landing qualities of a helicopter with the long-range, fuel efficiency and speed characteristics of a turboprop aircraft. Its mission is to conduct long-range infiltration, exfiltration and resupply missions for special operations forces.